It's the first day of September and even though it's still technically summer, I'm diving in head first to fall colors. My current obsession is sienna, a beautifully rich combo of brown, orange, and yellow. I love the earthy feel to it, and I'm especially digging this shade on my Free People Kimono. The tie dye pattern gives it that extra boho feel, and it's super soft and flowy which is always a plus for me. It's no secret I'm obsessed with all the trees, plants, and flowers in Venice - every street you walk down there seems to be the most gorgeous greenery! Beautiful succulents, cool cacti, and big ol' palms everywhere you look. It really is heaven for me, love those jungle vibes. All these pics were taken on a walk down one tiny street on my way to Abbot Kinney Blvd, just to give you an idea of how much amazingness is jam packed into every inch of this town. Major plant goals! What a crazy California winter we've been having! Rainmageddon is finally over (we really needed it with our drought) and the sun is shining again. I've been wearing rain boots, jeans, and winter coats for weeks, so our first day of warmth and sunshine I broke out one of my fave Free People dresses and comfy heels. Venice is forever my favorite part of LA. I love all the beautiful palm lined streets, delicious restaurants, amazing shops/boutiques, the canals, and of course, the beach. It's such a small little community that everything is bike ride-able, and there's always something to do or see. 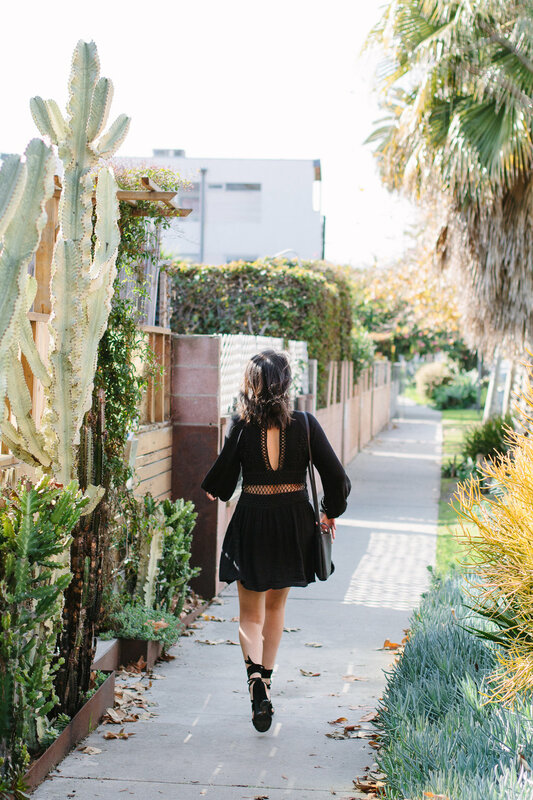 Going on walks with Eddie and exploring all the little neighborhoods is one of my fave things to do - there are some of the most gorgeous homes in Venice! Venice is also cactus/succulent heaven. Front yards, sidewalks, & entryways are filled with them, I can't get enough! I always feel like I'm in paradise, just walking down the street.